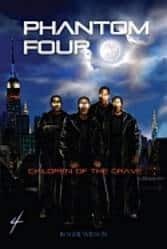 Four young boys die from unknown causes and rise from their graves 20 years later with dark powers. Learning to harness and control those abilities in order to fight for the powers of light, they will have to face Lucifer and the powers of Hell… in New York City. The dialog seems forced and a little campy. An example, Lucifer, talking to one of his minions says: “Silence, you peasant.” Most of the devil’s dialog seems to come out of the old B-movie scripts. His followers are the same. The main characters, the so-called “Phantom Four” are supposed to be fighters for the side of God. Yet they spend a fair amount of time chasing for tail. Yes, they all seem to hook up with decent women, but not before hanging in a bar and looking at everything in sight. If this had been written with a more traditional novel approach, with paragraphs, and some slight adjustments on some of the dialog I would be giving this a great review. I just found it hard to read in this screenplay format and the cheesy conversations didn’t help. A teeny bit stereotypical in spots, but still a good concept.